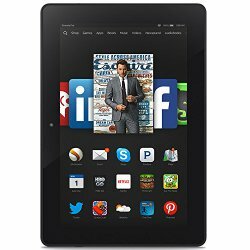 As part of Today’s Deals, Amazon has a Kindle Fire HDX 7″, HDX Display, Wi-Fi, 16 GB (Previous Generation – 3rd) for $149.99. That is 30% ($65) off the regular price. The HDX model is considered to be Amazon’s answer to the iPad, because of its high density 323 ppi / 1920 x 1200 display. Covers and cases that fit this model will be marked for the 7″ HDX, 3rd generation or for the 2013 model. Note: This price is listed as good for today only. This entry was posted in Daily Deals and tagged Fire HDX, tablet. Bookmark the permalink. ← Daily Links: How secure are New York City’s new Wi-Fi hubs?